These are weeks of mourning and extreme crankiness. No, nobody died or anything that dramatic. On Tuesday the 4th June at approximately 8.35 am in the morning a crazy out of control P plate driver in a big four wheel drive complete with excessive bull bar tried to take a corner on two wheels in the wet and slammed into my poor unsuspecting car and effectively ended its life. I'm emotionally attached to my car. I'll admit it. I knew the old dear was coming to the end of its life but it didn't deserve to be finished off so ignominiously, consigned to the scrap heap for an accident that wasn't even its fault. The cranky bit comes from ending up extremely out of pocket for an accident that was in no way my fault. It still makes my ears steam just thinking about the unfairness of it all (and yes everyone was properly insured). So these two weeks were all about inconvenience, dealing with insurance companies and wreckers and the budgeting for the gap between what the old car was deemed to be worth and what it was going to cost to replace it. I had to go to car yards and buy a new car which involved have to deal with a dreaded used car salesman. I do like my new car though. I has been christened the Tardis by the boy and I (both Doctor Who fans) as it is both blue and bigger on the inside (see the next weeks post for photos of it). Day 152: The car is dead. I know this doesn't look like enough damage to say put it down but it is. There's more panel damage all down the driver's side. Photographs don't do true justice to the sheer amount of damage and lot of it is structural and underneath. It's not fair that you can be minding your own business and driving sensibly and get wiped out by an idiot who can drive safely and has only had his license for 6 months or so. I wasn't injured but it was shaky day. Day 156: The Melbourne Museum. An extreme display of the art of taxidermy. When I was kid I remember all these specimens being displayed in glass cases. Now they are in a tiered room arranged by continent with giant touch screens so you can find about each animal. It's awesome and surreal. Day 157: Stealing the hubby's car. At least he's not working this week and doesn't need it. I have to remember how to drive a manual though. I didn't stall too often though. I also borrowed the middle daughter's little pink Hyundai. That makes me feel like I'm 18 all over again. Day 158: I think I'm breaking the rules of this whole photo a day thing here. This was taken on my camera but I didn't take it. My sister did. I needed new "action" shots of me a work for various official websites. So here I am in the middle of a mock stats lecture. You should see the outtakes. They are hilarious. I didn't realise just how many silly faces I pull when I'm teaching. I do think I look like I'm enjoying myself here though. Day 163: Home made chicken, spinach and ricotta ravioli. The sauce was spectacular - creamy mushroom and wine. The bench was horrendous to clean. Dried on flour sets like cement. Every so often, I give myself a massive pat on the back for having the foresight to marry a professional chef (except when I get to clean up after him). When he's really bored he cooks for entertainment. Day 164: My first batch of students that I instructed all by themselves graded two weeks ago. Today I got to hand out a pile on new yellow belts. I took a serious group photo but I'm mindful of their right to privacy. Here's the boy goofing around in his new black belt. Day 165: The eldest daughter after a life time of classical dance, jazz and hip hop has decided that being a cheerleader is a perfectly legitimate way to keep fit. 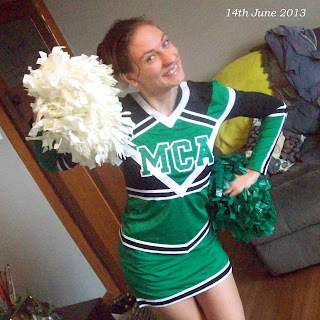 Her first comp is at the end of June and here she is showing off the uniform. We're all having a little bit of trouble taking the concept seriously.